Anna-Marie Maldonado, age 60 and a resident of Safford, entered into eternal rest Tuesday evening, October 9, 2018, at her residence, following a brief and brave fight with cancer. Anna-Marie was born November 9, 1957, in Morenci, Arizona, the daughter of Gabriel R. Maldonado and Amelia C. Ruiz, joining her siblings Gabriel, Jr., Rebecca and Guadalupe. She obtained her education in Morenci including attending the old Morenci High School. Anna-Marie met and fell in love with Seferino M. Sanchez and they were together for 38 years. Together they were blessed with five children, Catalina, Rebecca, Marianna, Seferino III and Moises. Throughout her life Anna-Marie gained a love of sewing, coloring, cross-word puzzles and playing lottery scratchers. She was known for her compassion and would often help and give assistance to those in need, giving her time and love to them. Although young at heart, Anna-Marie reveled in her title of grandmother. She was an exquisite lady but, when necessary, could be tenacious and resilient. Anna-Marie was a parishioner of St. Rose of Lima Catholic Parish. 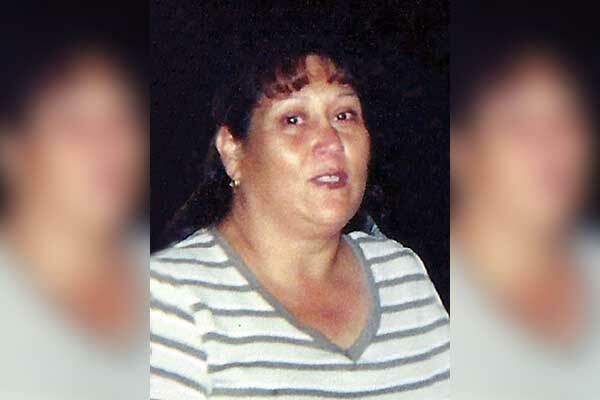 Anna-Marie leaves to mourn: her love, Seferino M. Sanchez; her children, Catalina R. Maldonado, Rebecca R. Alvarez, Marianna M. Sanchez, Seferino Sanchez III and Moises S. Sanchez; her sister, Rebecca Villescas; and her brother, Gabriel Maldonado, Jr.; twenty grandchildren; one great-grandchild; and her beloved pet, Marley Marie Maldonado. Anna-Marie was welcomed into Heaven by: her parents, Gabriel R. Maldonado and Amelia C. Ruiz; her sister, Guadalupe Burrella; a great-grandchild, Guadalupe A. Soto; and her great-great grandchild, Analiah M. Sanchez. A Mass of Christian Burial for Anna-Marie will be celebrated on Thursday, October 25, 2018, at 10:00 a.m., at the St. Rose of Lima Catholic Church by Rev. Nicodemus Shaghel. A Rosary will be prayed for Anna-Marie on Thursday, October 25, 2018, at 9:00 a.m., at St. Rose of Lima Catholic Church. The family will receive friends on Thursday morning, October 25, 2018, from 8:00 a.m. until 9:00 a.m., also at the church.